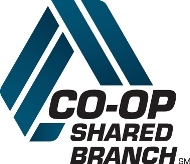 CO-OP Shared Branch is a service that allows ECCU members to participate in a national network of credit union branches. It gives you access to your ECCU accounts at more than 5,000 locations to conduct in person banking transactions such as making a deposit and cashing a check. So no matter where you live, work or travel, you'll always have access to your ECCU and a local branch office. Need Shared Branch access for your ministry? Please call Member Services or your relationship manager to request shared branch access and find a local branch to support your needs. Can I use a shared branch for my ministry or business accounts? What types of transactions are available at a shared branch? Do I need to know my account number? What do I need to bring to the branch? Where do I go inside the branch to process my transaction? Are there any limits to the amount I may withdrawal by cash or ceck? Will a hold be placed on my deposits?